Battle Mage: Your creatures have a chance to cast a random spell when they attack. If I know anything about Siralim, this perk can be a double edge sword. 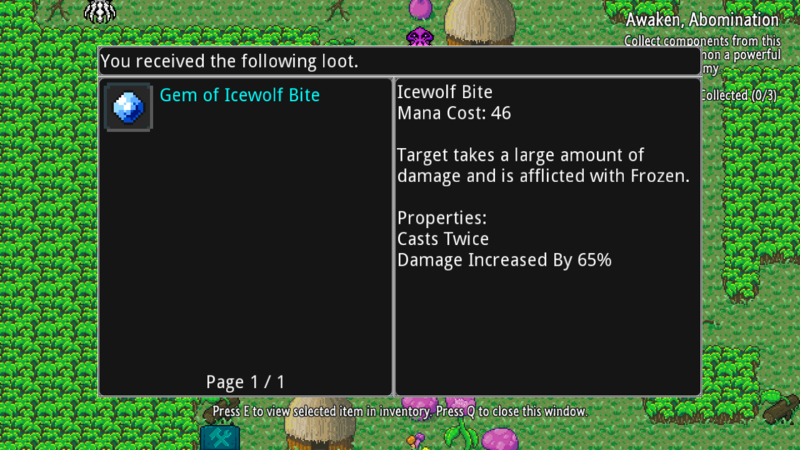 Also, Perks are unlocked later in the game in Siralim 2, they do not impact the early game. That answers some questions. Thank you. Lone Wolf: Your creatures deal 20% more damage, take 10% less damage, and have 20% more Health for each creature missing from your group. I've been meaning to ask about this ability of the nature mage for a while now. It says that with each creature missing from your group, does that include monsters defeated on the mage's side, or just monsters not filling up slots, like at the start, when one only has 1-2 monsters at the start? If it is the latter only, it is pretty situational for both the start, and that one specific hound monster that fuses with the other hounds to become one powerful monster- making it even stronger. Or does that not count, which then I wonder how it can be used strategically. Can't wait for this game. I spent wayyyyyyy too many hours on Siralim 1 before I completely broke it. One thing I haven't seen mentioned anywhere though...can we name our artifacts now? Zack has always been reluctant to give too precise numbers about the game mechanisms. I agree with that because it encourages learning through experimentation instead of calculation. Will Graft work with the repentance systems' Strife? Because that seems exploitable. In the S2 screenshots for gems/spells, it has language like "does a large amount of damage". Can this be clarified to the multiplier of Intelligence that is used? Clarify to say "does (Intelligence x 230%)" or somesuch? It makes it difficult to compare similar gems/spells if they all say "does a large amount of damage". It's also helpful to know what stat affects the spell (if any at all). "does a large amount of damage" doesn't actually specify if the spells utilizes Intelligence, Attack, HP, MP, or Defense stats. Im not sure how magic damage calculations handle bonuses from stats, if some spells gain more than others, or if its more streamlined, but I do agree that a bit more transparency than "deals a large amount of damage" would be welcome, at least for me. All of the classes seem really compelling. Immensely excited for early access next week! I agree, but perhaps that's the point - starting out in S1 as life and switching to chaos/nature when needed was a no-brainer, more interesting to not have a clearly optimal choice presented. I'm not as excited about these perks as the S1 perks. Nothing really stands out as a "must have", but that's probably a good thing. In S1 - Life, Chaos, and Nature stood out as having must haves, but Sorcery and Death were just meh. I imagine that Mana Costs vs Mana Pools and regeneration is the type of thing that will need to be tweaked during Early Access. That being said, I really like this vision and I hope you can pull it off. If you can make higher and lower mana cost spells both useful (in different situations or different team setups) that would be awesome. It would be particularly awesome if some players choose to give the same creature both Minor Healing and Major Healing in order to use both of them situationally! This had the virtue of being very easy to understand. I haven't heard anything regarding damage equations for Siralim 2, but I would be kind of surprised if Zack changed this.